Friday August 23rd 1878 It was a very warm day. I did a lot of cake baking in the morning. The folks got up from the valley early. we had a good visit with them. I worked the button holes in Mothers dress after dinner. About four oclock I got ready to go over to Wildes. The young folks came afterwards. We had a pleasant time. Came home about nine oclock and found Rob taking the flag pole of the house for fear of lightning. We all sat up there awhile. 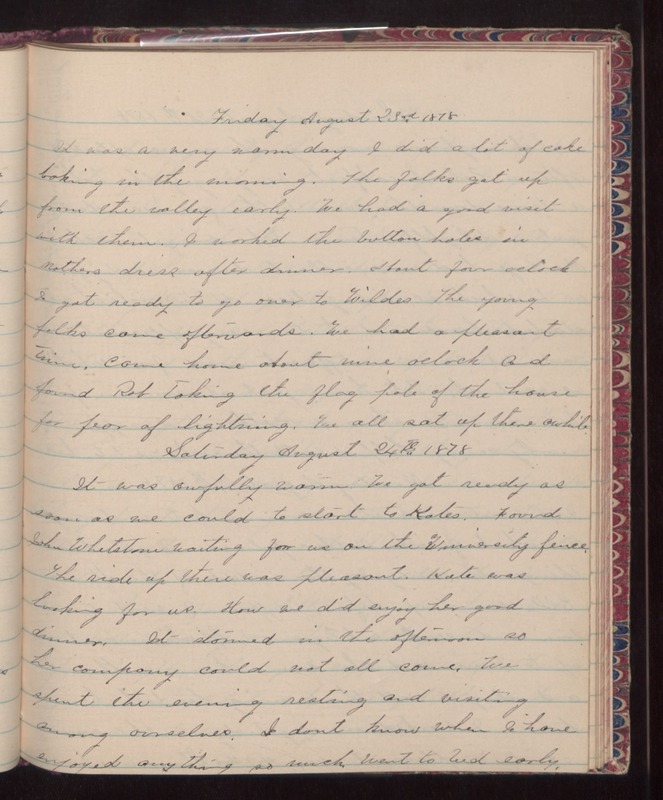 Saturday August 24th 1878 It was awfully warm to get ready as soon as we could to state to Kates. Found John Wheltstone waiting for us on the University fence. The ride up there was pleasant. Kate was looking for us. How we did enjoy her good dinner. It stormed in the afternoon so her company could not all come. We spent the evening resting and visiting among ourselves. I don't know when I have enjoyed anything so much. Went to bed early.